﻿Record Store Day: Calendar, History, Tweets, Facts, Quotes & Activities. Record Store Day seeks to promote and celebrate independently owned record stores as well as bring together vinyl enthusiasts. The day focuses on independently owned stores whose product lines consist of at least 50% music retail and where the main primary business is its physical store location. 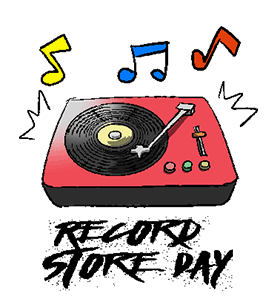 Today, corporate and online retailers are making it increasingly difficult for the smaller independent locations to compete and so, Record Store Day aims to support these real, live, physical, indie record store - not online retailers or corporate behemoths . Record Store Day originated in 2007 when independent store owners came together to discuss the idea. Record Store Day was first held on April 19, 2008. Every year, Record Store Day has an official ambassador who wears a ceremonial sash and promotes independently owned record stores (notable ambassadors include Metallica, Jesse Hughes and Ozzy Osborne). Since 2008, independently owned record stores and music artists all over the globe have joined together to support the cause. According to the Almighty Institute for Music Retail, as of 2012, there are only approximately 1,600 independent record stores in the US. Global recorded music sales totaled $15 billion dollars in 2014. The recording industry's global revenue were primarily generated by digital revenues (46%) and physical sales revenues (46%). The physical sales number is down from 60% in 2011. Between 2013 and 2014, the recording industry's digital revenues grew by 6.9%. This growth can be attributed to music subscription services, which increased in number by 39% over the same time frame. Enter a Record Story Day contest for a chance to win related prizes. Contest rules and entry are located on the Day's webpage while other contests are offered on social media pages controlled by Record Store Day. Attend a Vinyl Record Fair. Fairs are held all across the United States and in bordering regions of Canada. They feature collectable records, independent vendors, rare records and the ability to purchase other record types such as cassettes, CDs and even books. Watch a movie or documentary about record stores and their culture. Some of our favorites are: Empire Records (1995), 500 Days of Summer (2009), Nowhere Boy (2009) and Sound It Out (2011). Purchase records from your local independent record store. On Record Store Day, many stores have new releases or exclusive old records available for purchase. Some of the larger record stores even have visiting artists that can autograph your new purchase. In addition to purchasing records, purchase an official Record Store Day T-shirt, cap or bag to help the cause. The shirts have graphics and writing such as, I still buy records or record store day to help generate awareness for the day.